last week I had a chat with nelson, who lives in the Dominican Republic, about post workout meals. I wrote that I ate two slices of low-carb bread with serrano ham and, after some chatting, I realized that you can't buy low-carb bread in every country. I live in Germany and you can buy it here in almost every bakery but it seems like this isn't possible in every part of the world. At the end of our conversation I told him that I will translate a recipe so that he (and, of course, all of you too) could bake his own fresh low-carb bread. Heat up a convection oven to 300°F (150°C) and keep the heat at least 15 min. before you put in the dough. Put the curd cheese, the eggs and the baking powder together in a large bowl and mix it well with a (electric) hand mixer. Now put all the other ingredients (except of the butter and the sunflower seeds) in the same bowl and mix it again. The dough could be a bit smooth/liquid, but that's ok. Grease a baking pan with butter and pour the dough into it and dredge it with the sunflower seeds. You should store it in the fridge in a paper bag (the bread is slightly wet and could molder in a plastic bag). 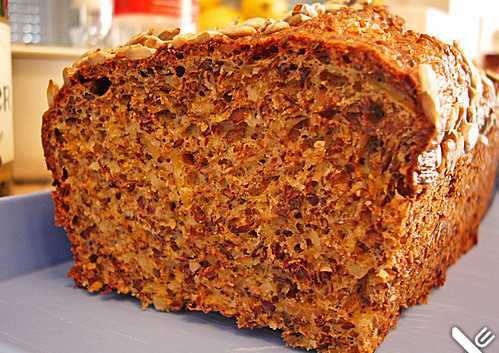 Now you can enjoy a health, delicious low-carb, high-protein bread! Looks interesting! I may have a go at making this - always interested in grain-free and low carb recipes! you should try it out. It's really tasty. I'm gonna post some more low-carb recipes in the next days/weeks.